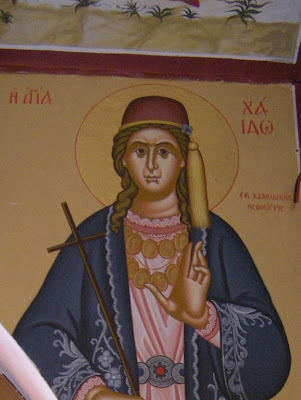 Saint Haido was from the village of Stano in Halkidiki and she lived in the 19th century. After the Revolution of 1821 she left with her mother and settled in Thasos, because a Turkish ruler sought her hand in marriage and she did not want to convert to Islam or marry a Turk. Because of her refusal she was tortured in prison to convert, but she continued to refuse to renounce Christ and her heritage. Till this day one can see where Haido was imprisoned in Stano. She only escaped because the village priest and some young men helped break her free. In Thasos she entered the Monastery of Pantokratoros in Kallirachi, where she served in the church and lived a life of purity fully dedicated to God and taking care of her mother. After the repose of her mother she dedicated her whole life to prayer and fasting and she acquired spiritual illumination. It is said that she reached an angelic state by her heavenly way of life, and for two days she was caught up into Paradise where she witnessed heavenly mysteries. Upon her return she related her experience to Hieromonk Gerasimos who served in the Monastery. While still young she succumbed to sickness due to her austere way of life, and she reposed in peace. Before her death, she advised those with her to not change her clothing before her burial. They however did not obey. When they went to change her clothing an earthquake occurred and thunder sounded and a voice was heard saying to put her old clothes back on. When this was done there was stillness and her holy relics began to exude a beautiful fragrance. She was buried in the cemetery of the Monastery. The memory of St. Haido was kept alive locally and she was considered a holy woman. Due to her suffering for Christ, many hail her as a neomartyr. 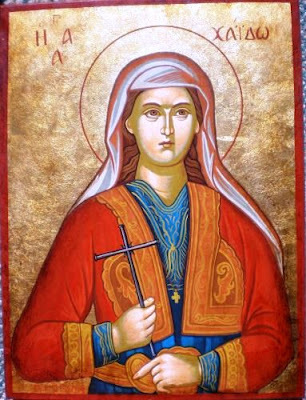 The Church of the Entrance of the Theotokos in Stano commissioned an icon of her to be made, which was done by the Cyrillian Brotherhood of New Skete on Mount Athos in 1960. She was canonized locally by the Metropolitan in 1988 and her feast was established for September 1.